Yes, you read that right. 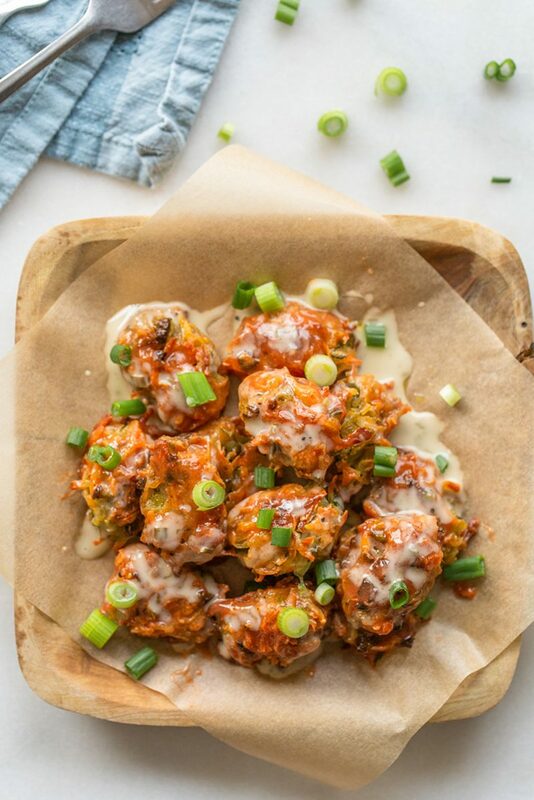 Introducing paleo buffalo ranch tater tots. 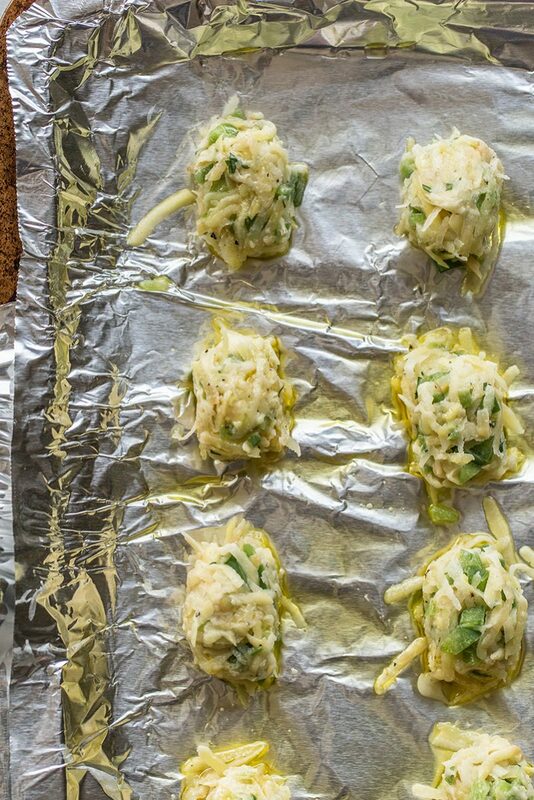 A game day recipe favorite, an appetizer that WOWs, and a healthy version of a comfort-food classic you’ll crave on the daily. It’s everything awesome in tot form, and Whole30 compliant too! Sadness hit our house a few weeks ago when both our beloved teams were officially ‘out’ of the Super Bowl running. We both grieved. It was hard, it was emotional, but we’re better now that we have these PALEO BUFFALO RANCH TATER TOTS to look forward to on Sunday! I mean, I don’t typically promote using food to cope with emotional distress, but this is different. Football woes are different than normal ‘real’ problems, mmmmk? I don’t care about Tom Brady, I don’t care about the halftime show, I don’t care about the hyped-up commercials. I care about tots and tots only. Don’t bother me with game stats and reminiscing about the Packers Super Bowl victory in 2011 (although it is a fantastic memory to boost the spirits). 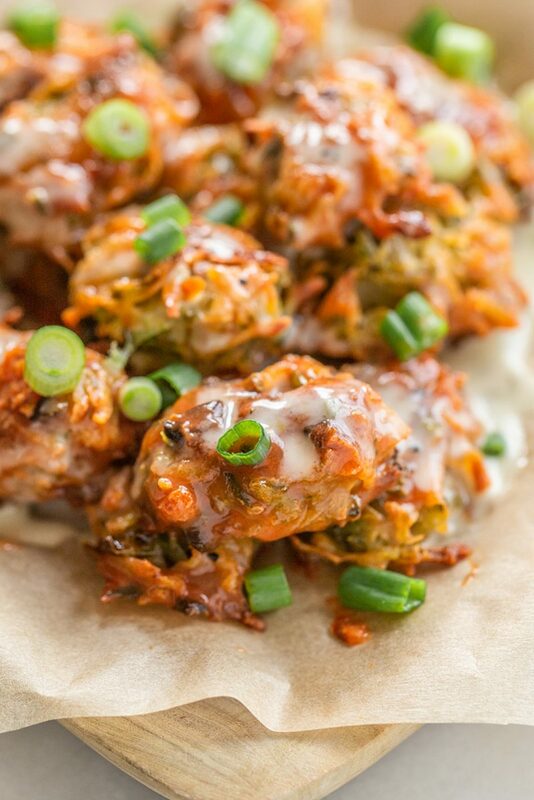 Just let me enjoy every precious bite of these paleo buffalo ranch tater tots and don’t give me dirty looks when I lick my fingers clean. The Super Bowl may be meant for watching great athletic talent and gathering with good friends, but it also means FOOD and that’s the real winner anyway. These babies are homemade and full of goodness. Grain free, dairy free, and Whole30 compliant too! Just grate, assemble, and bake these beautiful homemade tots and let the sauces come on at full force. I like to make it easy on myself buying paleo ranch like Primal Kitchen, but you could make your own too (for you super ambitious people). Frank’s Red Hot will work for this recipe or Tessemae’s Buffalo Sauce. Both paleo and Whole30 compliant. Then get eating! 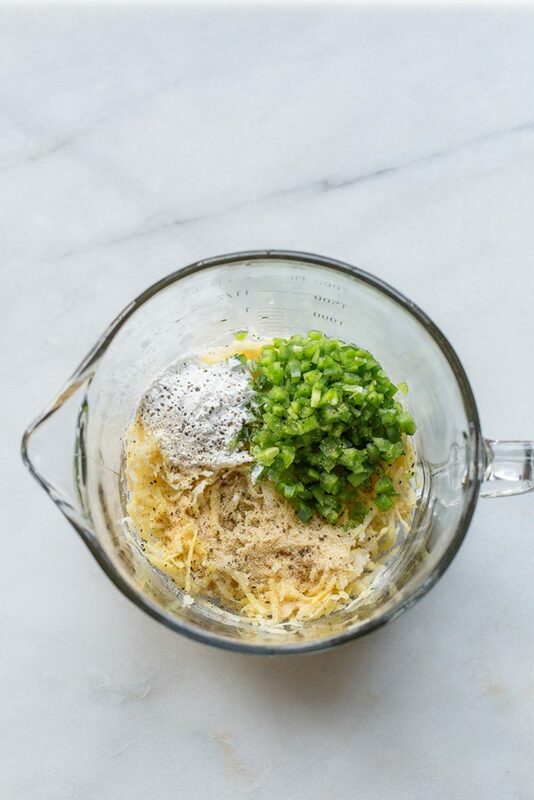 I love a few extra green onions over the top and sometimes shredded chicken if I’m making this a real meal. The possibilities are endless and delicious. My only advice is consider doubling or tripling this recipe if you’re serving a crowd. 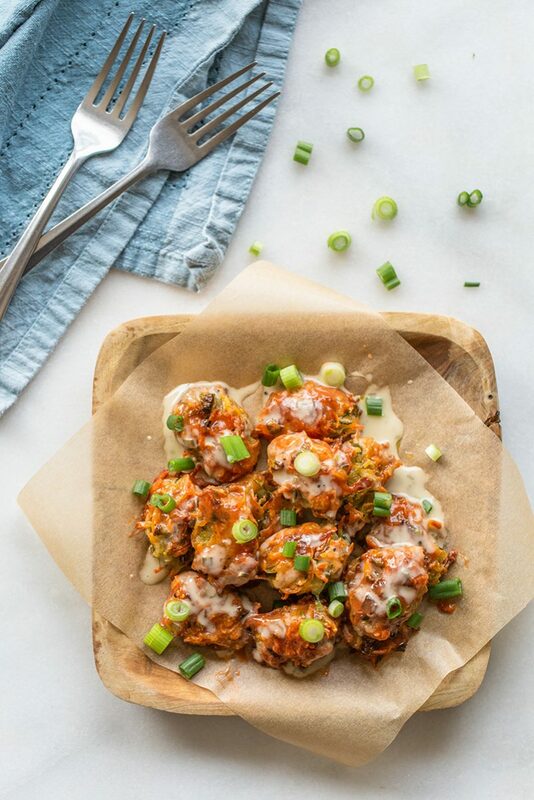 They’ll go FAST, and nothing spoils the big game more than an empty plate of paleo buffalo ranch tater tots. It would be truly, truly tragic. Now go forth, baking, sauce it up, eat. Cheer or ‘whoop whoop’ if you have to. Gamble thy money, drink thy beer, dance thy touchdown dance. And be sure to check out these other recipes perfect for game day eating! 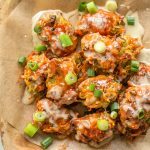 Whole30 Bacon Enchilada Jalapeño Poppers, Paleo Dill Pickle Wraps, Endive Plantain Taco Cups, Honey Tequilla Lime Chicken Drummies, and for even more buffalo goodness, these Whole30 Baked Buffalo Chicken Meatballs too! 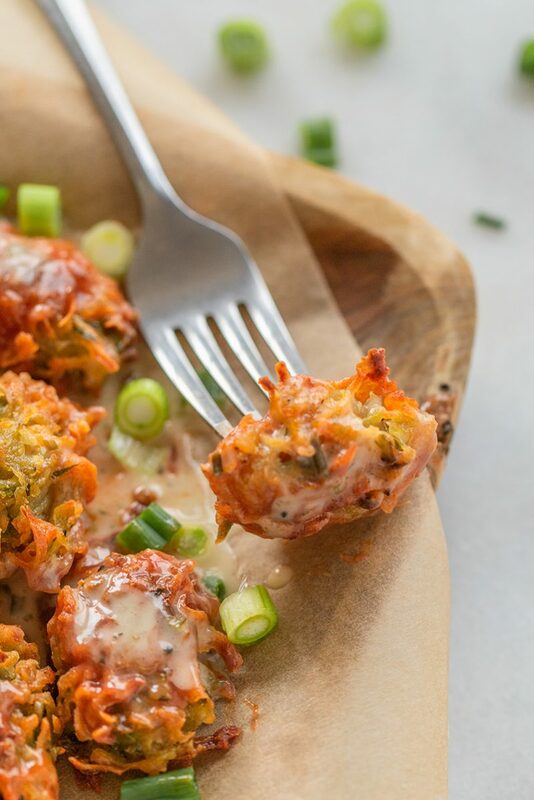 These healthier baked paleo buffalo ranch tater tots are the perfect appetizer or side dish! Whole30 compliant with tons of flavor and easy assembly!